Mondo Gronk @ drkrm Photographs No Movie Asco September 12 through October18, 2009 Closing Reception Saturday, October 17 from 7-10pm. 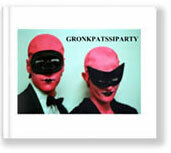 drkrm.gallery is pleased to announce MONDO GRONK. This historic exhibition - the first ever public presentation of never-before-seen photographs by the internationally renowned painter, printmaker, muralist and performance artist, Gronk - will be on view at drkrm. gallery from September 12 to October 18, 2009. There will be a closing reception with the artist on Saturday, October 17 from 7-10 pm. Spanning the late 1970’s through much of the 1980’s, these black and white images present a visual record of Gronk’s photographic work that includes the East L.A. avant-garde art collective, Asco (Spanish for nausea) and it’s conceptual counter-cinema movement, NO MOVIE (making movies without the use of celluloid). This alternative cinema was forged from the refusal of Chicanos to accept their lack of access to Hollywood. They constructed single-frame idealized images of daily life, like a still from a film, that would tell a whole story. Along with Harry Gamboa, Jr., Willie Herron and Patssi Valdez, and in collaborations with Cyclona, Mundo Meza, Jerry Dreva, and Tomata DuPlenty, Gronk’s cinematic sensibilities challenged the limits of sexuality, gender norms, and taste. Gronk Nicondra was born in the barrios of East Los Angeles where he had known from an early age that he wanted to be an artist. "Drawing was as an escape for me - from poverty, from my environment. It was a way of creating new worlds for myself." He began his career as an urban muralist who had to look up the word “mural” to know whether he could paint one. Over time, he has grown into an international figure who has created grand sets for operas and computerized animation for panoramic screens. Gronk has made a lasting mark on the Chicano art movement, the punk scene, gay art, and the cultural world stage. Influenced by surrealism and German expressionism, Gronk's paintings reflect Chicano traditions while wryly commenting on themes of ethnic identity, high and pop culture, romantic love, and mortality. Gronk’s works are in the permanent collections of the Corcoran Gallery of Art in Washington, Los Angeles County Museum of Art, Los Angeles Museum of Contemporary Art, Denver Art Museum among others and has been shown in many more. He is represented in numerous private collections as well. Gronk lives and works in downtown L.A.
On Tuesday, October 31, 1978 Asco artists Gronk and Patssi Valdez had an exhibition and party at L.A.C.E. Gallery in downtown Los Angeles. The party included the second and final performance of punk band The Snappers. But that night Snapper members Gerardo Velasquez and Michael Ochoa met Edward Stapleton and decided to form Nervous Gender. No photographs of Gronk were taken. No photographs of Patssi Valdez were taken. Just a voyeuristic view of their guests and the demise of The Snappers and the spawning of Nervous Gender. Louis Jacinto began photographing in 1973. His work has appeared in the Los Angeles Times, The Advocate, Frontiers Magazine and Drop Dead Magazine. In addition, two photographs from his book, PUNKROCK LOSANGELES, have been added to the permanent collection of the Claremont Museum of Art. As a member of the Los Angeles art collective LAART, Louis has exhibited throughout Los Angeles.